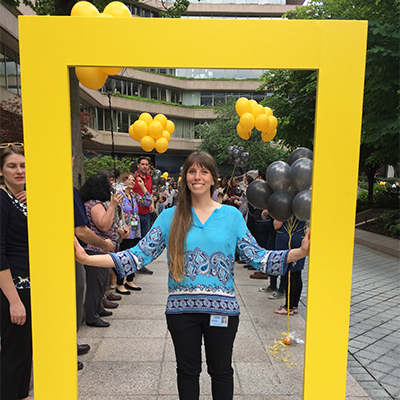 Rachel Beery, a double major in geography and international studies, reflects on her internship experience with National Geographic. Why the combination of international studies and geography? When I came to Ohio State I knew I wanted to travel for my career, but I wasn’t sure what my major should be. I decided international studies would be the best route after taking an international studies course. Then I took a geography class with Professor Matt Coleman and I absolutely fell in love with geography, so I picked up the second major. Ohio State has so many high-rated departments, it seemed like the best choice. Explain your role with National Geographic. I was one of four geography interns working in the Education Department on the curriculum team. As an intern I assisted with the development of educational resources such as activities, lessons, educational media, online course content and conducting research, tracking deliverables and timelines and providing feedback. The content we created goes on natgeoed.org. This is a website that teachers can go to and use the content for free since we are a non-profit organization. I also have been a part of events such as the National Geography Bee, a geography trivia competition for kids’ in grades 4 to 8 competing for a $50,000 scholarship. I sat in the audience as it was televised and during that week we did a ton with the kids. These students were super smart and it was incredible to watch. In addition to this event, I supported events such as BioBlitz, Explorers Symposium and Young Explorers Symposium. This year was the Centennial of the National Park Service and National Geographic collaborated for a National BioBlitz, an event in which teams of volunteer scientists, families, students, teachers, and other community members work together to find and identify as many species of plants, animals, microbes, fungi and other organisms as possible. Favorite part of the internship? My favorite part of the internship was the Explorers Symposium. All the explorers funded by National Geographic came to share their compelling stories. I was so inspired that I now know I want to apply for the young explorer grant. How did you find your internship with National Geographic? My geography advisor helped me find this internship. My advisor, Brooke Raake, is constantly sending out emails with a variety of opportunities. Other involvements at Ohio State? I am going to be the vice president for geography club this coming year. I’m the VP of membership development for global leadership initiative, action team leader for MUNDO and English conversation program facilitator. I also was a Buck-I-SERV trip leader.